McMurray Musings: Edmonton Escapade, Part Two! Yesterday I left off my post on my recent escapade to Edmonton in Transcend Coffee, a lovely little coffee shop on Jasper Avenue. As I noted I was visiting the city as a guest of the Edmonton Economic Development Corporation, and the EEDC had devised an exciting little itinerary for me jam-packed with interesting things to do. When I finished my latte I collected my things and trotted off down Jasper back to my hotel, the charming Union Bank Inn, so I could freshen up before my dinner meeting with Peter Silverstone, incoming EEDC board chair. I was way past pleased and into delighted. I believe the word that left my lips was "Woohoo". I like food, and I like wine. And frankly it was just the little pick-me-up I needed before leaving to meet Peter at Tres Carnales, a Mexican restaurant just down the street from the hotel. After enjoying the wine and cheese and strawberries I headed out towards Tres Carnales. Walking in I found a small and crowded restaurant, obviously very popular gauging from the line up of people waiting to be seated or order food. It's an interesting little spot, small tables scattered around and a few seats lined up bar-style against the windows so you can watch the world go by. I spotted Peter quite quickly and we fell into conversation just as quickly. You see, I had met Peter when he came to Fort Mac to deliver a presentation at the Leading the North conference I attended in January. Peter is a very interesting man because he's done a little of just about everything. He is a physician, and he has done research. He's been a professor, and he's been a businessman. And recently he wrote a little book called "Greenest Oil", a fascinating read for anyone involved in the oil sands. I wrote about Peter's presentation at the conference because I was mesmerized by it - and not just by what he said but rather how it was received, because he said some things you don't often hear in Fort McMurray. He engaged in some "courageous conversations" of the kind people would much rather avoid, and I was intrigued. I was intrigued even more, though, because Peter is just obviously a very intelligent man, and I like intelligent people. I always hope that I might gain some of their "smart" by osmosis, as I'm not nearly as clever as I'd like to be, and so I welcome any chance to spend time in the company of those who are bright. I had been looking forward to dinner with Peter ever since the EEDC had mentioned it, and I wasn't disappointed. The discussion Peter and I had was wide-ranging, everything from oil sands to communities. We talked about image problems - Fort McMurray's and Edmonton's, and how these challenges affected our communities. We talked about the relationship between our cities, too, and how it could be strengthened. Peter said Edmonton has such a vibrant arts and culture community (and they do!) and said he wished more people from Fort McMurray would consider Edmonton a cultural hub where they could see live theatre and hear music and visit galleries. I told him that I suspected many in Fort McMurray see Edmonton as an enormous shopping mall, a place to get those things we cannot get our hands on in our own community (and I am guilty of this, people - I believe in shopping local but if I can't get it locally typically my next stop is either Edmonton or the internet). We talked about industry and writing and how Edmonton plans to grow their community. And I, of course, talked about Fort McMurray, about how this community is changing, and how it is an ever-exciting place to be. We sat and we chatted and we shared, and in the end we exchanged email addresses and promised to keep in touch - and I know we will, because I think we found some common ground as well as some points where we disagree, just as it should be. We talked about finding people you can "spark" from, people who have different ideas and thoughts, and how those ideas can inspire and spark your own - and certainly Peter is one of those people for me. And while we chatted we enjoyed the food from Tres Carnales which is, in a word, fabulous. We had guacamole and chips, the guacamole fresh and tasty. We shared the dishes we had ordered, my Rajas Con Cremas quesadilla (grilled poblano chilies, sweet corn, and onions) and his Al Pastor Torta (roasted marinated pork on a small tortilla), and the food was terrific. Fresh, filling, and very, very tasty, it was very clear why Tres Carnales is such a popular spot. Add to that some great service from the wait staff and Na-na, the guy in charge, and it was a pretty great place for Peter and I to sit and chat. Then add to that the El Jimador Palomas Y Margarita I had (really the only important word in that name is, of course, "margarita") and it was pretty much perfect. 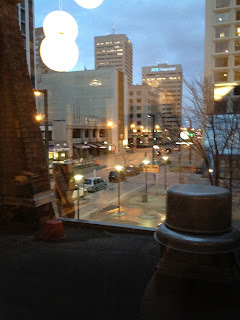 We had taken one of those window seats so we could watch Edmonton parade past the window but I admit I was so absorbed in the food and our conversation that I didn't notice a damn thing going on outside. When we finished dinner Peter walked me back to my hotel, barely half a block away. We parted knowing that we would see each other again at the EEDC luncheon the next day, and I headed up to my room. I arrived in my lovely little room, window blinds still open and the night time lights of Edmonton's downtown clearly visible through the glass. I sat down with my laptop, flicked on the little fireplace, and reflected a bit on the conversation Peter and I had shared. I thought about the differences between Edmonton and Fort McMurray - but more about the similarities. For all our differences we are far more the same than we are different. It is so easy to point out the differences that separate us, whether we do so with people or with communities, but the reality is that it is our similarities that tie us together. Those similarities are what makes us neighbours. Those similarities are what draw us together, and they are, in the end, what truly matter. Peter and I are very different people who have done very different things in our lives - and yet at the end of the day we discovered the similarities between us, while noting the differences. In the same way our respective communities have this dialogue about our similarities and our differences. We explore what makes us the same while recognizing those things that make us different. But that is what makes the dialogue interesting, people. Because if we were exactly the same or completely different the dialogue would falter and we would have nothing to talk about. But just as Peter and I have a great deal to discuss I think Edmonton and Fort McMurray have a lot to talk about, too - and it is a conversation between neighbours, just as it should be. I tumbled into bed that night exhausted from day one of the Edmonton Escapade. I had had an absolutely brilliant time, but I knew the day ahead of me was going to be another day packed with excitement - the annual EEDC awards luncheon, a shopping tour with Edmonton fashion and lifestyle blogger Kendall Barber, and seeing "A Midsummer Night's Dream" at the Citadel. The Escapade was turning into quite the little adventure, and I was learning something along the way, too. I was learning about Edmonton, certainly, but even more I was learning about what Fort McMurray could bring to Edmonton - and it's all of us, people. We can bring all of us to Edmonton for a little neighbourly conversation - and it's a talk worth having, I think.